Confession: I have essentially been having the same breakfast for nearly 3 years, and I still love it. Now before you get ahead of yourself and toss everything into the blender - WAIT and read what years of smoothie expertise has taught me. First add in your cup almond milk. I recently started making my own and it's so easy and a great way to have tasty dairy free milk without all the weird chemicals, but of course store bought will work here too. Next, add in the spinach. It's really up to you how much you'd like to add, but typically ~1/2 cup is a good amount of spinach while still remaining undetectable in the overall flavor. Blitz!!! 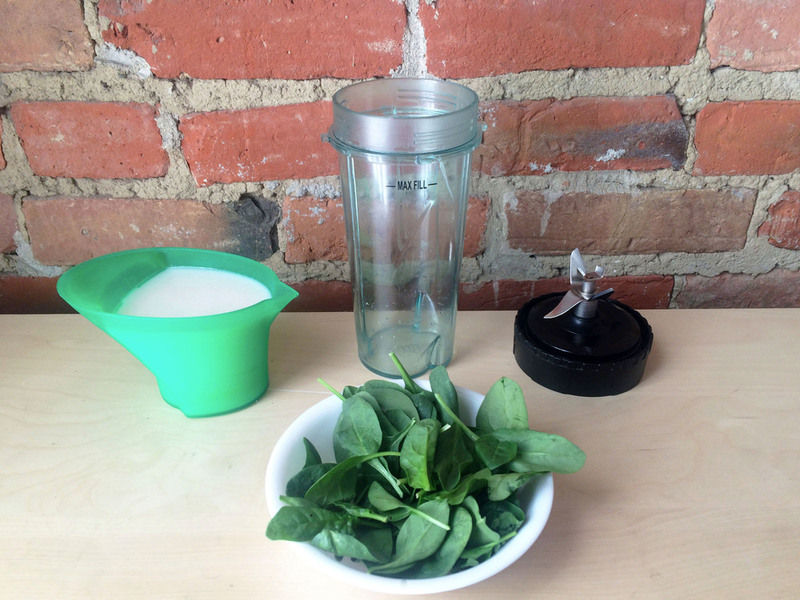 Blend together the almond milk and spinach until all of the spinach is completely mixed into the milk and there are no little leafy pieces in there. Add in your cinnamon, chia seeds and frozen banana and blend! I recommend freezing the banana sans peel and sliced into small pieces for easiest blending. Bananas with brown spots are the best for smoothies, the more brown the easier it is to digest and the sweeter it tastes! Blend everything together until it's your desired consistency and a nice light green color. Pour into a glass, usually a 12 oz mason jar works for me, and enjoy! Do you like green smoothies? Please let me know if you give this a try! Take a photo and tag us on Instagram @awoolstory. ***ALSO*** would really appreciate y'all signing up for the A Wool Story newsletter - just put your info in the box to the right to get info and updates, discount codes, and more FUN STUFF! !